When you think about Indian festivals and celebrations there are a few images that come to mind in an instant: colourful outfits, Bollywood style costumes/jewellery/dancing/singing and of course, decadent food and sweets. 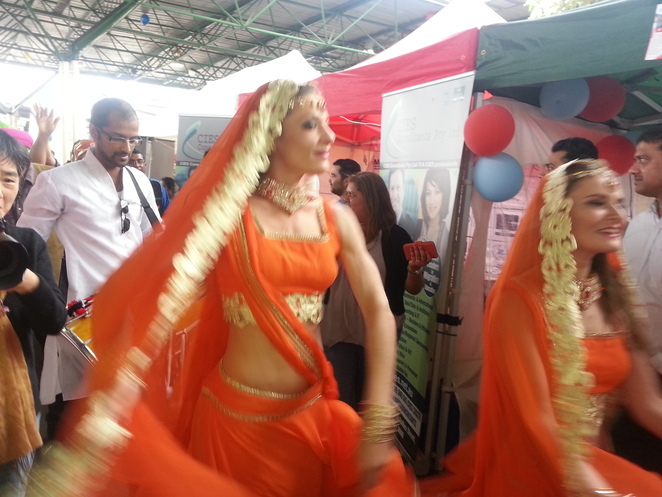 You can experience all of the above and more at this year's India Day celebration, which is another name for India's Independence Day and is celebrated each year with much gusto on 15 August around the world wherever the Indian diaspora lives. 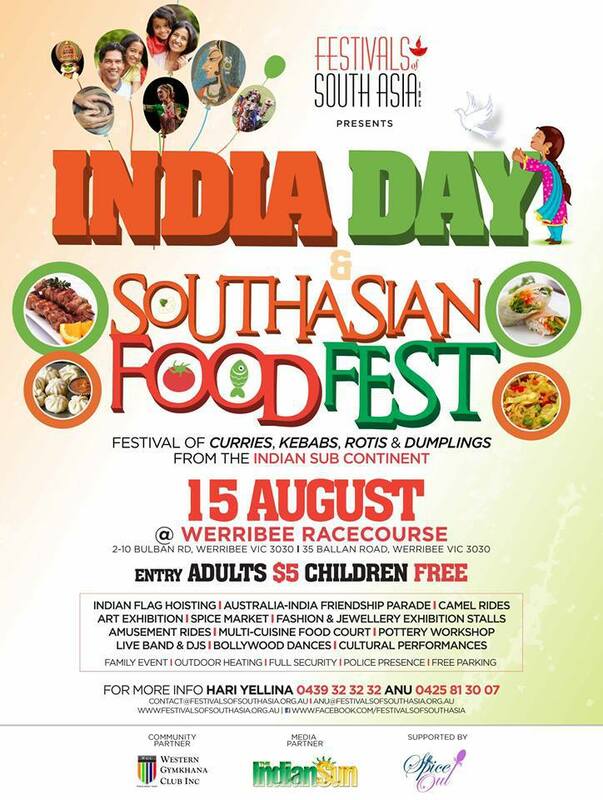 The Festivals of South Asia Inc is hosting this year's celebration at the Werribee Racecourse on the actual day i.e. Saturday 15 August 2015, starting at 11am and ending at 9pm. Highlights will include a flag hoisting ceremony and an Australian-Indian friendship parade. The stage will be hosting a wide range of entertainment for people of all ages and backgrounds because music and dance have no language and thus make a great instrument for breaking barriers. For the children, there is a long line-up of activities including camel rides, pottery workshop, Bollywood dancing lessons, rides and so much more. For the food-lovers, the event promises a cultural and culinary extravaganza, which only means mouth-watering and tantalizing traditional dishes, sure to please patrons. For the art-lovers, there will be an exhibition, and an opportunity to get acquainted, or re-visit if you are already familiar with the rich heritage of this beautiful land and people. A fashion show is also being featured for those who are inspired by Indian couture. 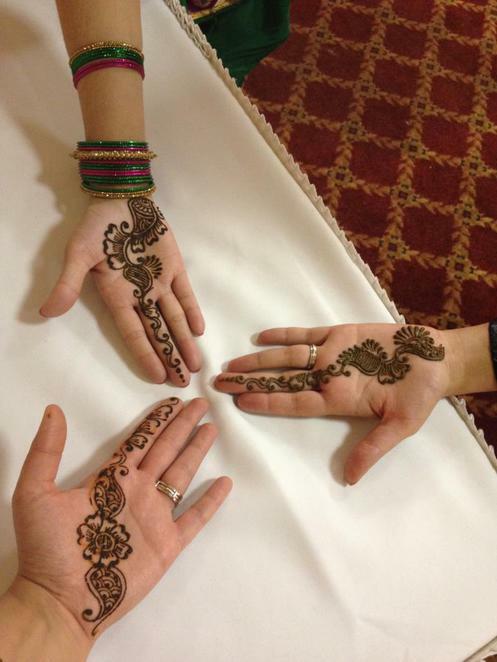 There will be an opportunity to buy Indian outfits and jewelry as well. Henna painting will also be available. The organisers are also inviting small businesses to showcase their products and services to the large number of visitors expected to pass through the course of the day. Gates will open at 11.00am and close at 9.00pm. Entry is $5 per adult (children free). For more information, please contact Anu on anu@festivalsofsouthasia.org.au / 0425 813 007 or Hari Yellina on contact@festivalsofsouthasia.org.au / 0439 32 32 32 / 93 32 32 32 for Stall or Sponsorship Applications. seems like it will be lots of fun!